The Save Lowfields Playing Fields Action Group has stepped up its activities following the decision of the York Council to submit a planning application aimed at developing the local playing field. The application was made two weeks before the current consultation, on the Draft Local Plan, was due to conclude. The Action Group have submitted an alternative development plan in response to the Local Plan consultation. 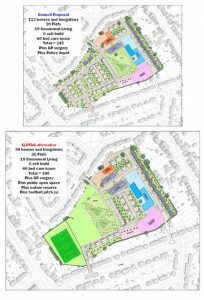 It shows that the playing field could be conserved while still allowing 200 hundred new homes and flats to be accommodated on the site of the school buildings. One key driver for the opposition is the Council plan to move the football pitch over 2 miles to a site on Sim Balk Lane (where it will become the home for a Bishopthorpe based football team). The Action Group has quoted the Councils own figures which show that the Westfield area is already short of all forms of open space and sports pitches. They have won the support of local Councillor Andrew Waller who says he will object to the plans unless they are amended to save the playing fields. In his local newsletter he says that the proposed alternative open space and sports facilities are simply too far away from Lowfields to be of any use. He points out that there isn’t even a direct bus service to the Sim Balk Lane site. The original proposal, tabled by the Council in 2011, would have seen a care village, aimed at older people, built on the school site. 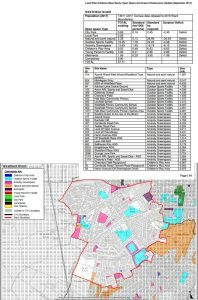 At that time around 70 housing units were proposed.